Oh, wait, you’ve played The Wind Waker? Ah. No imagining necessary then. Who didn’t have their mind blown pretty severely by this part of The Wind Waker? The journey down into Hyrule was both extremely predictable while being both unprecedented and just downright cool. Is there anyone out there who’s played The Wind Waker who doesn’t count it among their favorite moments? I say it’s unprecedented because, well, look at the series so far: There were only a few Zelda games to make very direct references to previous titles in the series before The Wind Waker, and none of them did so on the scale that the boat game does. Previously, you had the same Link from The Legend of Zelda moving on to acquired the Triforce of Courage and awaken the original Princess Zelda in The Adventure of Link, but the original game’s storyline — minimalist as it was — had little to no real relevance to the events of its sequel; it was just a subsequent story, something of an aftermath. Majora’s Mask is Ocarina of Time’s aftermath as well, and depicts this a bit more directly by showing Link speaking with Zelda after that game’s ending and continuing the use of the Song of Time, but again the plot of Ocarina of Time is basically irrelevant. There are of course other continued stories on that timeline, but they were less clear until the timeline was released and, possibly, didn’t really exist in a concrete form prior to the timeline’s release anyway! So, as I said, prior to its release, no Zelda game tied back to its predecessors on the scale that The Wind Waker did. Not only did The Wind Waker reference the entire storyline of Ocarina of Time in its intro — which was epic in its own right — but went on to continue to make its connection to its predecessor incredibly clear through the events during the game itself. Across the first and second visits to Hyrule Castle beneath the waves, the player finally witnesses the interior of the same castle they were unable to explore in Ocarina of Time, sees a statue of the Hero of Time himself, sees stained-glass depictions of the Six Sages (in The Wind Waker’s adorable artstyle! ), pulls the Master Sword (again! ), discovers that their partner all this time was the King of Hyrule that, again, we never saw in Ocarina of Time, discovers that the Pirate’s Charm is derived from the familiar Gossip Stones, and uncovers Tetra’s true lineage as Princess Zelda alongside the fact that her crew descend from her attendants or at least some form of workers at the castle. And during the game’s climax in that sunken Hyrule you’re even treated to Ganondorf speaking of life in his homeland in the desert and a confrontation between him and the King of Hyrule that is most likely the same one he’d deceived many, many years prior. My god! People say Twilight Princess and Skyward Sword have epic moments — and they do, to be sure — but do they even come close to comparing to this stuff? The Wind Waker has so many plot threads that are never ditched as the story unfolds like you see in some other games, but more importantly, is there any other Zelda title in which so many epic events unfold? Ones that have such shocking impact, epic presentation, or that tie in so deeply with previous games’ storyline details? Does even Ocarina of Time, the beloved jewel of the franchise, manage to compare in this aspect? Hell, The Wind Waker manages to expand on Ocarina of Time’s story, and very directly so. The Wind Waker has one of the coolest storylines of the series, and certainly works the best with the other games that were out at the time to create a cool, and continuous, storyline. And we have these moments beneath the waves, in the Hyrule of old, to thank for that. Holy crap, though! It still blows my mind just thinking about the first time I went through it. It’s such a great moment that, at least for me and I’m sure for many others, it’s stuck with me all this time as a favorite moment in not only Zelda but video game stories in general. I wasn’t even much of a fan of the series by the point when I played The Wind Waker, but having at least played the last three console titles in the series, it still made a huge impact on me as a cool moment for tying in so much. And maybe I’ve complained about excessive similarities between storyline details in multiple games in the past, but in The Wind Waker it’s a vastly different case, because in fact its storyline does differ from the events, motivations, and general happenings in other Zelda games, in particular Ocarina of Time; it’s a continuation, not a copycat. I would have written about this moment long ago had I not thought speaking about this moment was a bit overdone, but whether it is or not I finally felt compelled to write about it. So how about you? 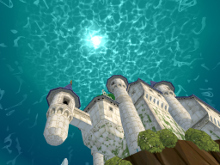 How did you feel about the various visits to Hyrule beneath the ocean in The Wind Waker? Were you much of a Zelda fan prior to this moment, and did the connections to Ocarina of Time make a big impact on you? Was this your first Zelda game, and if so, did this moment still seem epic? (I’m especially curious of that one, as I feel the presentation here stands on its own, so I’m interested to hear from people who didn’t get the Ocarina of Time connections.) Or were you not much a fan at all? Tell me in the comments!